I'd also like it to be compact and look unobtrusive. I'm somewhat budget-conscious too; preferably I'd like to stay below 800€ including a Windows license (yeah I know, but I need that for certain games). So far, I was thinking about getting the Fractal Define Nano case and putting the new passively cooled Palit KalmX 1050 Ti in it. But I was wondering whether it'll fit; several reviews of the Nano have mentioned that there isn't much clearance between the PSU and video card, and the KalmX looks a bit bulky with its big heatsink. Also, I'm not sure whether the KalmX would even be beneficial in terms of noise; obviously it doesn't generate any noise itself, but maybe it would make the case fans work harder? What do you think? As for the CPU, I'm a bit torn between the i3-7100, i5-7500 and the low-TDP versions of the i3 and i5. In terms of temperature and power consumption, do the low-power versions really make a difference under gaming loads? And considering the rather modest video card, would an i5 be adequate or overkill? I also still have to decide on a motherboard, PSU, HDD and memory, so if you have any recommendations for these, fire away. - Is your monitor 1080p? - Is the compact PC case required due to space constraints (like going into a cabinet/under a desk, etc)? If so, what's the space dimensions? A good rule of thumb for any gaming build - avoid the Intel T CPUs. Most games like fast CPU clocks. Thank you for your answers and the warm welcome. The reason for the small case is mainly aesthetics, and occasionally portability. I think the most demanding game I intend to play is GTA V, or maybe The Witness (not sure about the requirements on that one). I was, and maybe still am, considering the Gtx 1060/6Gb but I liked the 1050 Ti for the low TDP, low-ish cost and the fact that a passively cooled version is available. I won't put the PC anywhere with restricted airflow. And while I will use it for other stuff besides gaming, none of the other stuff exceeds the requirements of the games. Ok. Could you also list your non-gaming apps so I can get a feel for your CPU/RAM requirements? A major limitation to mini-ITX is the two RAM slots. So, with the 800 euro budget restraint, I'd suggest getting 2 x 4GB RAM sticks...but, if you have apps that consume major amounts of RAM (Photoshop, s/w development, possibly video editing, etc), then you'd have to go with 2 x 8GB sticks now. The G4560 Pentium will do great with with GTA V - here's a nice writeup on the CPU at ComputerBase. GTA V will also do nicely at 1080p with the GTX 1050Ti 4GB. High textures uses a bit more than 3GB of VRAM. I don't know about The Witness. A long performance thread [url=https://steamcommunity.com/app/210970/discussions/0/458606877334633700/here on Steam. [/url] I leave it to you to investigate. Passively cooled card: In general sounds like a great thing. In specific, it'll still need directed cooling (decent case fans and airflow through the case) in order to not throttle while gaming. It might still be quieter than an active card...then again some of these gaming cards are damn quiet during gaming (and any worth recommending have passive fans except while gaming). Thanks, I am indeed in Germany, so that would be nice. Apart from gaming, I'll only use the PC for the usual browsing, video streaming and some programming (but only small hobby projects). I'm pretty sure 8GB RAM is sufficient; that's what's in my current computer (ThinkPad W520), and I never felt I needed more. Here's a first cut at a build with the G4560 Pentium and 1050 Ti KalmX in the Define Nano S case. It came out to ~850 Euros with Win10 license. Some comments...it's always fun trying to fit stuff into a mITX case...the Nano is larger than many, but still has restrictions. If you wanted to expand the case size a bit, there's the new Define C Mini for uATX and mITX. Less restrictions on PSU and cooler size. - cooler: best in class for it's price/performance. It comes with a spacer for socket 1151 builds...you may or may not need it. Install outside the case with the spacer and if it doesn't tighten down (as in, you can move the cooler), then you don't need the spacers . - gpu: the case will accept 2 slot coolers and this is a 2 slot cooler. The bigger concern is the gfx card's height above the PCIe bracket...but, if you look at the case, it looks like there is plenty of room. Pic below. - mobo: Not a lot of selections seen on partpicker for mini ITX....This Asrock board is reasonably priced, will have great BIOS level fan controls, and has an Intel NIC. It does have an older audio codec...could be fine..don't know how important audio quality is to you....boards higher in the stack may have better audio solutions...then again, if it really matters, you can go digital out and use a USB DAC. - PSU: 160mm is the limit and this is 160mm...could be a tight fit. An alternative is go with Corsair's shorter SFX PSU and a SFX to ATX mount. There's also be quiet's excellent Straight Power 10 500CM (also 160mm). - Case: I think the included front 140mm fan can be slid up/down. You'll want to get some directed airflow over the gfx card. - Storage: Samsung 850 Evo is a great and reasonably priced OS/Apps SSD. It is about the same size (less depth) as Fractal Define Nano and can take ATX, mATX, mITX motherboard. The older Styx is almost the same (not ATX) and maybe cheaper. What I like with that case is that it has kind of two departments, one for GPU and one for CPU. No problem to fit a Palit KalmX 1050 Ti that can get air from one or two top mounted fans (slow spinning then gaming and stopped then not). CPU heat is exhausted by a bottom rear fan. It suffers of the same Styx & Metis (and of both inverted ATX design and solid front cases) issue: it's an hot box, at least with stock cooling, and particularly for passive GPUs, and it cannot be improved easily. What a shame no one out there want to rebuild the old NSK3480 in a more modern way. A not solid front option is the Silverstone KL06, it might deserve a look. Thanks for suggesting (and debating) another case, but I think I'm really set on getting the Define Nano since I really like its looks and think that it's decent enough in terms of temperature and noise. Maybe not 100%, so if there were some case that was a lot more convincing, I might consider it; but given the reservations that Luca mentioned about the Thetis, I'd rather not consider it. Thanks for the configuration, I really appreciate the effort you put into it. Also I looked at the Pentium article you linked, as well as other benchmarks of this chip and agree that it is probably sufficient for my needs, and better value for money than the i3. Regarding the CPU cooler, I had initially planned to first go with the stock cooler and see if it bothers me before going for an aftermarket cooler. But I'm not sure whether that makes sense, given that I would save on shipping if I order the aftermarket one together with the other stuff I need. What is the general consensus about the Intel stock coolers, are they tolerable or garbage? Also, I have another question about the passive GPU. As you have pointed out, space doesn't seem to be an issue. But looking at pictures of the card and the case, I think that the card's heatsink in this case would be on its bottom side, while the best airflow through the case would seem to be on the top side, which seems odd to me (for actively cooled cards as well). Would that be a problem? mobo: I like MSI (see my signature), but this board has an even older audio codec and a Realtek NIC. Asrock BIOS fan control is also better. stock CPU cooler: For 50W class CPU, the stock cooler could be ok...depends on your level of noise sensitivity. Don't have any hard data. gfx card cooler: That's the PCI spec in play. There's a limit to depth behind the slot...and that's why you'll want to place the single fan such that it blows directly over the card or get another front fan. While the PSU won't generate a lot of heat*, the area between the PSU and gfx card will be a potential hot spot and need directed cooling. Your gaming power load will be ~130W. With this low load, the PSU fan won't turn on when you are playing games. So, the PSU will radiate ~13W. A potential conflict: Asrock in the past has focused on having PWM fan headers...to the point where there was anywhere from zero to only 1 maybe 2 case headers that could be voltage controlled. The two fractal fans are voltage controlled. You'll want to do a deep dive into the mobo manual and see if it has two voltage control headers. Also, given the worst case heat load is in the 140W range, you won't need two front fans - hopefully the single front fan can be moved where you need it. I'll go with the Asrock then, for the fan control and audio. But if you don't mind explaining, what's better about the Intel NIC? There's a limit to depth behind the slot...and that's why you'll want to place the single fan such that it blows directly over the card or get another front fan. That makes sense. 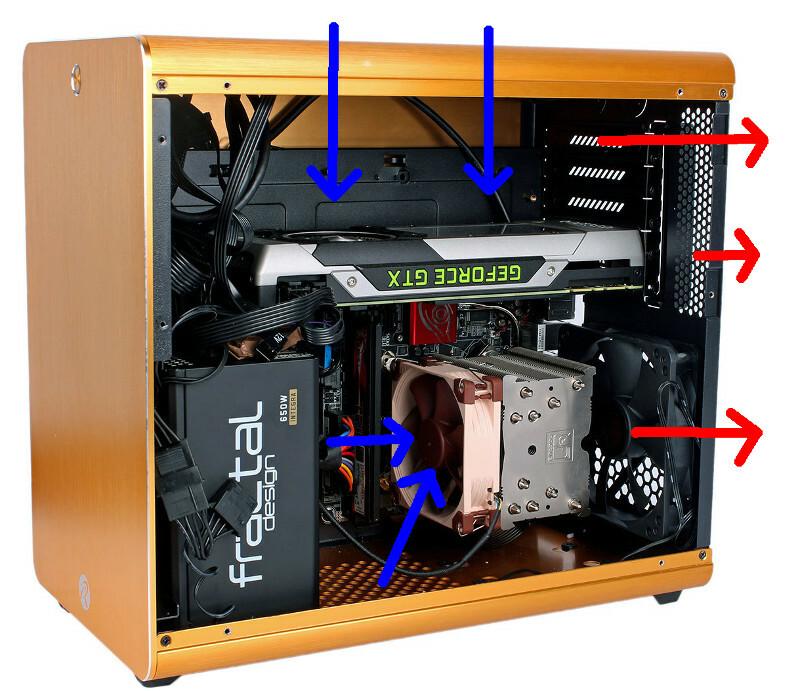 So, if we assume that the front fan is indeed adjustable, should the fan's hub be on the same height as the gap between the GPU and PSU? As for the motherboard fan issues, I'll look into that after work. However I just have to protest against that... hot box??? I am sure it also will work fine with the top fans as exhaust. A fanless PSU would be perfect but I think semipassive is ok too. I've never had a driver problem with an Intel NIC. Can't say the same for Realtek. Fan hub - well that's a dead zone for airflow I'd place the fan so the bottom aligns with the top of the PSU. Then, you get airflow over the PSU, the gfx card and straight to the rear of the case. Yes, and there are also some data around for the Thetis, in french: those cases, as well as IME most of inverted ATX designs and closed front panel ones, run noticeably hotter than competitors. Bit-tech already did some tests about Metis and Styx, as well as our co-forumer edh with the Metis. You may reverse the lower rear fan, and get some interesting figures but nothing definitive: particularly you may lower the CPU temp, but on the larger Styx that also leads to worsening the GPU one. Adding more fans might be beneficial, but YMMV. Last edited by quest_for_silence on Fri Mar 17, 2017 5:51 am, edited 1 time in total. Anytime a case requires cool air intake at the top of the case - which is the opposite of what naturally would happen - there will be a problem keeping it cool. Can a fan be attached to exhaust out the top? Are you planning on using a blower video card? I think the Fractal Design Define Nano S would be a much quieter system - the front intake is key, and the rear exhaust fan is at the top. And if that is not enough, you can add 1 or 2 top fans. With a bunch of fans in a small case I very much doubt there is such a thing as natural airflow. However like I said it will also work fine with the top fans as exhaust and personally I would use it that way because I like negative airpressure. Nevertheless, with 100-150W load I am sure any of those cases easily can be made both cool and quiet so it comes down to personal preference and aesthetics. As Steve already pointed out, if you use that Palit fanless VGA card in the Nano you must direct some airflow to it. The card is 18cm long just 2cm more than the PSU and will sit in more or less air shadow. Yeah, overkill/brute force is always an option! Yeah, I'm a bit worried about that myself. Then again, it is just a 75 W card. But I might get something more powerful at some point. After all, upgrading is half of the fun, no? This makes me wonder: Do the fans on on actively cooled cards pull fresh air onto the card or blow hot air away? gfx card fans are intakes - blowing onto the cooler/heatsink. So, the air pushes through the radiator fins. Regarding fully passive cards... As long as the minimum fan speed of an actively cooled card is low enough, passive card seems rather pointless as they too do need some amount of airflow. I'm not personally a fan of Nano S thanks to "wasted" space and PSU location but I'm not the one deciding. So if you'd like a case about half the size, such as the Metis PLUS or Jonsbo U2, they have no problems keeping a 120W gpu and an Ivy i7 cool and very quiet(spcr-certified). Oh! They addressed the main weak of the Metis, nice! The Metis Plus is out because it seems to be only available with a window, which I don't want. But the U2 is interesting. Also, a friend of mine suggested the Node 304. Both seem to make better use of their interior space compared to the Define Nano. However, the reason I initially eyed the Nano was because it is Fractal's smallest model with sound dampening, which the U2 and the Node 304 don't have. Does the dampening make much of a difference? My friend has the Define R5, and it's really very quiet, but of course I don't know how much of that is due to the dampening material. The material adds some weight to the panels which can help dampen vibration induced noise. With slow running fans and no spinning hard drive, your vibration induced noise will be pretty low. So, not a big difference for you. About sound dampening -trust Steve !! I am afraid the Metis Plus is too small and would give you unnecessary hard work with cable routing and such things. Length of GFX card / PSU -this is a well documented problem, just Google. In the original layout, airflow is focused on hard drives and CPU. Will enough air enter through side vent for a passive GFX card? Maybe if you run the front fans very slow or even keep them stopped. but perhaps with back fan and PSU as exhaust and the bottom free from cables and drives it will get enough air. Also, a friend of mine suggested the Node 304. Both seem to make better use of their interior space compared to the Define Nano. In case, the Fractal Core 500 and Lian Li Q10 may be more sensible choices than the Node 304: check the relevant SPCR reviews. I'll look at the Lian Li. Why would you recommend the Core 500 over the Node 304? Mostly: good/better value (usually), large fans only, better compatibility. Please, Read The Fine Relevant Review.